A fire at a recycling centre involving some 20 tonnes of plastic waste has been brought under control. Toxic fumes were said to be coming from the blaze at Environcom in Spittlegate Level, Grantham, which broke out in the early hours of Monday. Police were urging those living nearby to keep windows and doors closed, and plumes of thick black smoke could be seen coming from the building. Spittlegate Level - near the A1 - was closed to traffic, with buses diverted. An Envirocom spokesman said the fire started in the "small domestic appliances processing area" at about 07:00 GMT and all staff were evacuated safely. The company takes in electrical appliances for repair, refurbishment or to be used for parts. Unwanted items are recycled. 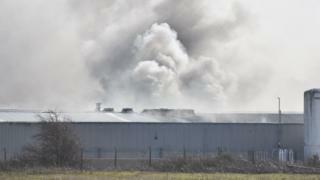 Eight fire engines were sent to the scene, with the blaze said to be under control by midday. Dan Moss, of Lincolnshire Fire and Rescue, said: "At the height of the fire, we had around 60-65 firefighters and we are now looking to scale those resources down, although we do still have firefighters on the scene so we can extinguish the fire fully." South Kesteven District Council said environmental health officers were on the scene, along with the Environment Agency. Cris Stephenson, chief executive officer at Envirocom, said: "Cause of the fire us unknown at this stage although lithium batteries could be a likely candidate for the source."